- Perhaps a bit obvious, but super important… a solar panel converts solar energy into a form that is useful for your devices. On a sunny day, you will get more energy than you will on a cloudy day. Additionally, the energy that you can get out of this device will fluctuate depending on shadows, people walking in front of your panel, changes in cloud cover, etc. Also, you need sunlight rather than artificial light. In other words, solar panels don’t generally work indoors. - Many solar panels are created for a specific voltage. For example, this panel outputs 5Vs and is compatible with many mobile devices (most anything that uses USB to charge). This voltage stays constant assuming there is enough energy to get it to the right level, so you buy a panel that is useful for the devices that you want to recharge. - Amps is a measure of how quickly electrons are flowing through a circuit. Generally, the higher the amps the faster it will charge. Many mobile devices have 1A or 2.1A chargers. Some devices, like iPhones, have the ability to detect when you plug into something that doesn’t produce enough amps. In Apple’s case, you get a warning that the accessory that you are plugging into may not be supported. 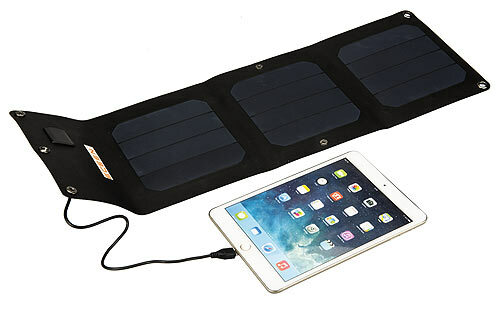 - Due to fluctuations in energy that is provided by the solar panel, it often makes sense to charge a battery rather than directly charging a device. 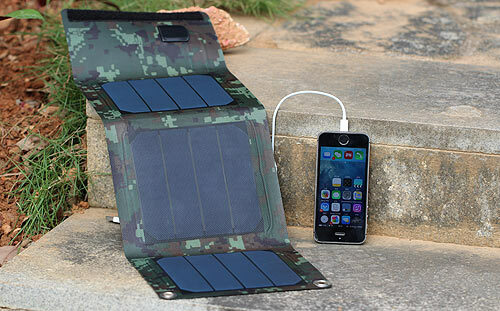 Then, you charge your device with the battery rather than the solar panel. This also is nice so that you can leave the less expensive battery charging at camp or home base while you are out and away for the day.